Wall Street plunged again on Jan, 11 amid renewed fears that the financial sector's troubles with bad credit won't soon end and that some consumers are buckling under the weight of a slowing economy. The major indexes each lost more than 1 percent, including the Dow Jones industrials, which finished down nearly 250 points. The arrival of quarterly earnings reports has investors worried about how banks and brokerages have fared after suffering losses in the collapse of the subprime mortgage market. Traders appeared to grow more pessimistic ahead of reports due next week from the nation's biggest financial institutions. Merrill Lynch & Co., Citigroup Inc. and JPMorgan Chase & Co. are slated to weigh in next week. Adding to investors' unease, Merrill Lynch might take a $15 billion hit from its exposure to soured subprime mortgage investments, according to The New York Times. The nation's largest brokerage is also said to be seeking another capital infusion to help shore up its balance sheet. Investors also grew nervous after American Express Corp. warned that slower spending and more delinquencies on credit card payments will hamper profit throughout 2008. A profit warning from Tiffany & Co. added to Wall Street's unease about the fortitude of the consumer. "When Amex comes out and says that some of their well-to-do cardholders are having problems making payments that's just not good news," said Brandon Thomas, chief investment officer of Portfolio Management Consultants, the investment arm of Envestnet Asset Management. Friday's session revealed the extent of misgivings about Wall Street's efforts to sew up its troubles. Bank of America Corp. agreed Friday to buy Countrywide Financial Corp. for $4 billion, a deal that rescues the country's largest mortgage lender but pays less than the company's market value. The agreement comes after word of the move Thursday and just months after BofA invested $2 billion in Countrywide. Some investors apparently hoped Countrywide would fetch a premium, though some observers said a tie-up was a better alternative than bankruptcy, rumors of which dogged the company during the week. Michael Church, portfolio manager at Church Capital Management, said news from the financials is weighing on Wall Street, although he said investors shouldn't be surprised by the extent of the troubles. "The financials are going to continue to be a problem," he said. The Dow fell 246.79, or 1.92 percent, to 12,606.30. The Dow had been down more than 300 points in the last hour. Broader stock indicators also declined. The Standard & Poor's 500 index fell 19.31, or 1.36 percent, to 1,401.02, and the Nasdaq composite index fell 48.58, or 1.95 percent, to 2,439.94. Stocks have skidded lower in the new year, with the Dow often falling by triple digits in a single session amid anxiety about a possible recession as well as the still-unfolding fallout from the mortgage crisis. The Dow is down 4.96 percent for the year, the S&P is off 4.59 percent, and the Nasdaq has lost 8.01 percent. "I think we're going to see this volatility at least through the end of the earnings season," Thomas said. Bond prices rose as stocks retreated. The yield on the benchmark 10-year Treasury note, which moves opposite its price, fell to 3.79 percent late Friday from 3.88 percent late Thursday. The dollar was mixed against other major currencies, while gold prices rose to a fresh record. Oil prices were pressured by gains for the dollar against the euro and pound. Crude oil is a dollar-denominated commodity and tends to decline in value when the dollar rises. This is because it takes less money to buy the same amount. A barrel of light, sweet crude for February settled down $1.02 at $92.69 on the New York Mercantile Exchange. Washington Mutual Inc. jumped 53 cents, or 3.7 percent, to $14.69 after CNBC reported JPMorgan is in talks to acquire the nation's largest savings and loan. JPMorgan fell 47 cents to $40.86. Bank of America fell 80 cents, or 2 percent, to $38.50, while Countrywide fell $1.42, or 18 percent, to $6.33. American Express fell $4.92, or 10.1 percent, to $44 and was the biggest decliner among the 30 stocks that comprise the Dow industrials. McDonald's Corp., also part of the Dow, fell $3.85, or 6.6 percent, to $54.32 after a Friedman Billings Ramsay analyst expressed doubt about the company's future earnings. Traders showed little reaction to a Commerce Department report that higher energy prices drove the nation's trade deficit in November to its highest level in more than a year. The government said the gap shot up 9.3 percent to $63.1 billion, the widest since September 2006 and up from $57.8 billion in October. Economists surveyed by Thomson/IFR Markets forecast a trade gap of $58.6 billion. Separately, there was good news on inflation in December, when import prices were unchanged, the Labor Department said. Federal Reserve Governor Frederic Mishkin said the Fed will act decisively to counter risks to the economy and added that swift rate cuts can hasten the economy's return to normal. But Mishkin also said the financial markets are overly focused on the central bank's actions. Boston Fed President Eric Rosengren said housing price declines could accelerate this year if the economy is not strong. Mishkin and Rosengren followed Fed Chairman Ben Bernanke, who on Thursday made clear in a speech that the central bank is poised to cut interest rates later this month. Declining issues outnumbered advancers by about 2 to 1 on the New York Stock Exchange, where consolidated volume came to 4.3 billion shares, compared with 5.03 billion traded Thursday. The Russell 2000 index of smaller companies fell 15.56, or 2.16 percent, to 704.65. Overseas, Japan's Nikkei stock average closed down 1.93 percent. 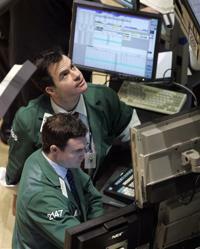 Britain's FTSE 100 closed down 0.33 percent, Germany's DAX index rose 0.06 percent, and France's CAC-40 fell 0.54. The Dow Jones industrial average ended the week down 193.88, or 1.51 percent, at 12,606.30. The Standard & Poor's 500 index finished down 10.60, or 0.75 percent, at 1,401.02. The Nasdaq composite index ended down 64.71, or 2.58 percent, at 2,439.94. The Russell 2000 index finished the week down 16.95, or 2.35 percent, at 704.65.